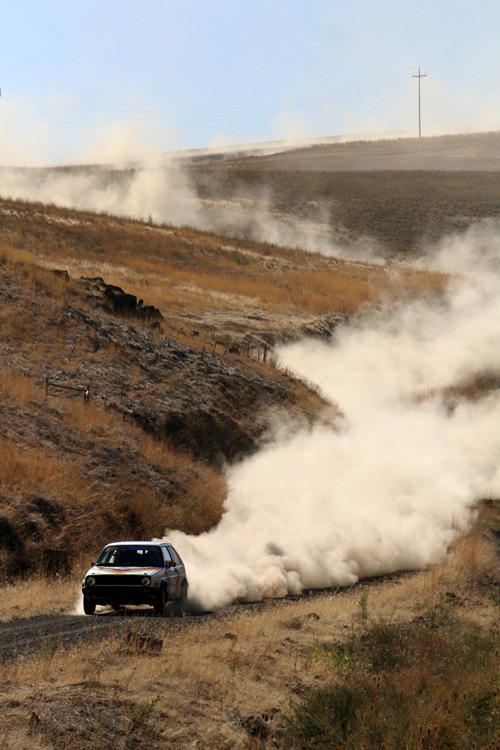 Six years after we spectated the Wild West Rally, we finaly got to return. Though the venue had changed drastically, we gave it our best shot. We were also keen to get our revenge on the last running of the Pomeroy roads, since that's where we had rolled the rabbit a year and a half earlier. To get back on the road quickly, we purchased the currently dormant Golf of Jim Thompson (who we had raced before). It's a well-sorted build by some of the best in the northwest and we were confident in the abilities. We had big plans for the car, but ran it at Wild West with few changes. The debut of the new car was spectacular, with 1st in class on both days and 6th and 4th overall finishes. Day 2 solidified our competitve bond with our favorite driver, Cody Crane, as well. Both of us pushed each other to go faster over the years and our battle at Wild West was a bit legendary. After this event, we wanted more power, though, so we began the process of adding a turbo and customizing various parts of the new car over the winter. Maybe we would have been better off just running it as is? Time will tell.